Well here is a Pavlova that we bake often at college as it is part of the Baking syllabus. Essentially a meringue based dessert that is baked at a low temperature that gives it a nice and crisp exterior and a soft and marshmallow texture on the interior. The dessert is named after the Russian ballerina Anna Pavlova. It now is a popular dish in both Australia and New Zealand. I have been baking crisp mini meringue cookies for awhile now. Quite honestly had never really savoured a Pavlova up until I had to teach it to my students at college. The key in baking a good Pavlova is setting the right temperature else they tend to burn out or stay under baked. Ensure the egg whites are completely separated. Even the tiniest bit of yolk will prevent the egg whites from foaming. Always make sure that the mixing bowl for beating the eggs is grease free as any traces of fat can prohibit eggs from getting fluffy. Use caster sugar as it dissolves easily. Whisky sugar and eggs till it doesn’t feel gritty any more. Do not beat this excessively as the Pavlova’s tend to weep once baked. 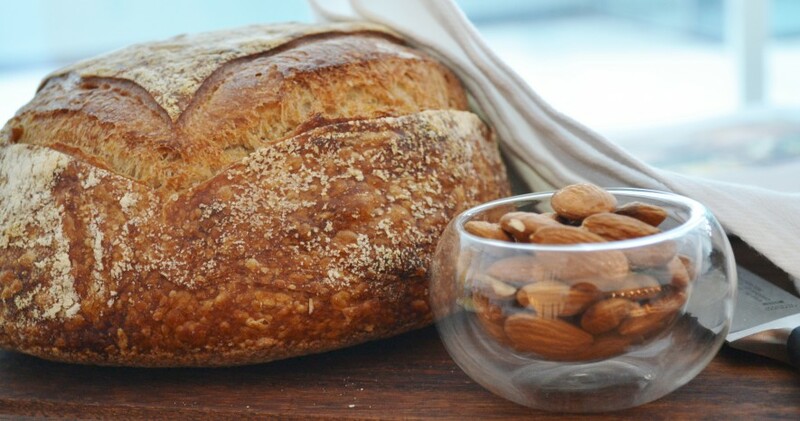 Beating vinegar and cornflour into the mixture creates a soft centre and a crisp shell. 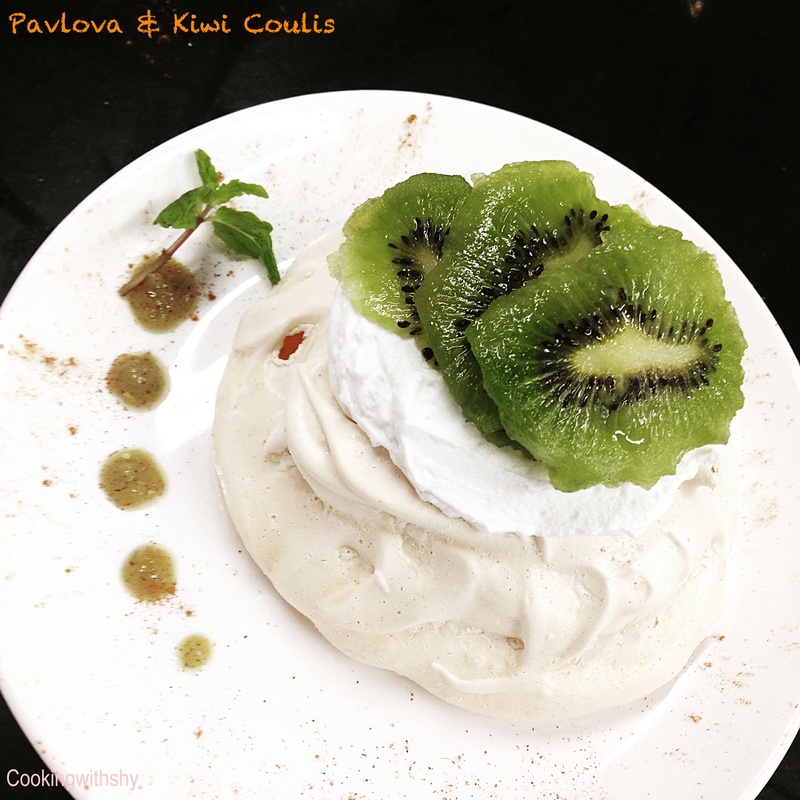 Bake pavlovas on less humid days. You may turn off the oven after about an hour and leave the Pavlova in the warm oven for about half an hour for the Pavlova to bake further, with the oven door ajar. Remember the inside must have a soft texture and slightly chewy on the inside. Pavlova’s make really pretty summer desserts for entertaining. You may bake a single large Pavolva or choose to make multiple smaller ones. The best garnish for this dessert is topped with some whipped cream, freshly chopped fruits and a coulis if you wish. The addition of a dessert sauce elevates the flavours to another level. I have used some fresh Kiwi along with a coulis,however most berries like strawberries, black and blueberries, mangoes, mixed fruit work really well too. 1.Preheat oven to 130 (degrees C) and place rack in center of oven. Line a baking sheet with parchment paper and draw 2 circles four inches in diameter. 2.In the bowl beat the egg whites on medium speed until they hold soft peaks. Start adding the sugar, a tablespoon at a time, and continue to beat, on high speed, until the meringue holds very stiff and shiny peaks. (Test to see if the sugar is fully dissolved by rubbing a little of the meringue between your thumb and index finger. The meringue should feel smooth, not gritty. If it feels gritty the sugar has not fully dissolved so keep beating until it feels smooth between your fingers). Beat in the vanilla extract. Sprinkle the vinegar and sieve the cornstarch over the top of the meringue and, with a rubber spatula, gently fold in. Spread the meringue inside the circle drawn on the parchment paper, smoothing the edges. 4.Just before serving gently place the meringue onto a serving plate. Whip the cream in your electric mixer, with the whisk attachment, until soft peaks form. Sweeten with the sugar and vanilla and then mound the softly whipped cream into the center of the meringue. Arrange the fruit in a decorative pattern, on top of the cream. Serve immediately as the meringue can get soggy. Wow ! This looks awesome, thanks for sharing a fail safe recipe for Pavlova.